Florin Marcus was presenting topic on Forms modernization during UKOUG Development SIG seminar in London. 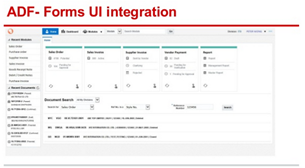 Session was based on our production experience from recent Forms modernization project to ADF 12c and Alta UI. – Who integrates Forms and ADF? – Java Plugin to be Discontinued. Consequences for Oracle Forms. – Why Yet Another Web Framework? Oracle JET. Go through the slides and learn more about it here.